Would you like to embark on a deer hunting expedition without spending too much money? You may absolutely do so without sacrificing your efficacy in the woods thanks to this 270 Win cartridge by Sellier & Bellot. This round’s bullet possesses an extremely concentric jacket, enabling it to rotate stably in flight that it may always find its target. This bullet’s core is exposed at its tip, so its jacket will peel away to permit the whole thing to warp and topple around within a soft target. The hard jacket will control that deformation to make it as effective as can be, assuring the wide and deep wound channel it takes to make a fast and clean kill. This round’s casing is fresh out of Sellier & Bellot’s factory, and is made of high quality brass. That means it not only feeds and ejects like a charm but is also happy to be reloaded many times. This round’s primer isn’t corrosive, so it will treat your rifle’s bore gently -- its propellant is similarly clean burning. What is the Difference Between a .270 Winchester and a .30-06 Springfield? The main difference is bullet size. The .30-06 is bigger in both bullet diameter and, generally, in bullet weight. )Although there can be a bit of overlap in bullet weight.) 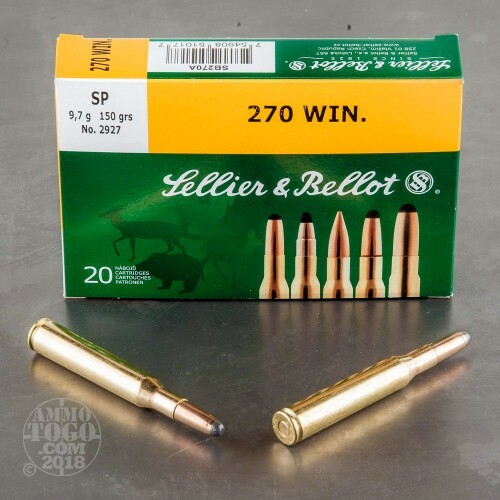 The .270 Winchester actually has a bullet diameter of .277 inches, while .30-06 Springfield ammo is loaded with a bullet that is .308 inches in diameter. 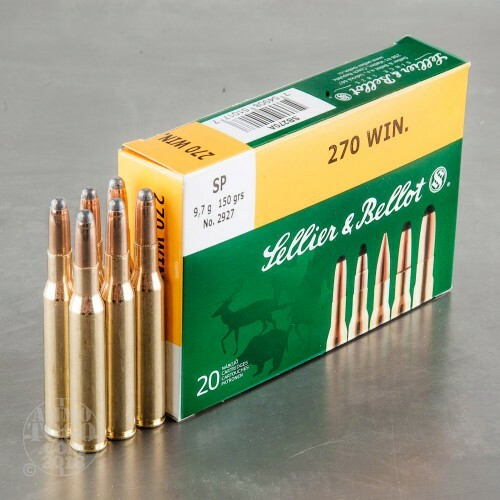 Bullet weight for the .270 Winchester is usually about 90 to 150 grains, while the .30-06 starts at roughly 125 grains and can go above 200 grains. The two cartridges carry roughly the same load of propellant, so the .270 is throwing a smaller projectile with the same propellant; the result is a bullet that travels faster and maintains straighter trajectories, while the heavier bullet of the .30-06 travels slower but hits the target with greater force. How Does the .270 Winchester Compare to the .308 Winchester? These are two very different cartridges. Compared to the .270 Winchester, the .308 is a wide, squat round that doesn’t have the straight trajectory for which the .270 is known. The .308 has a wider bullet, but most notably is also has a much shorter overall length. The length of a .270 Winchester is 3.34 inches, while the .308 Winchester ammunition is only 2.8 inches in overall length. Generally speaking, the .308 shoots a heavier bullet at a slower velocity, so downrange accuracy is not as good as the .270 Winchester. What is the Muzzle Velocity / Typical Feet Per Second (FPS) for a .270 Winchester? 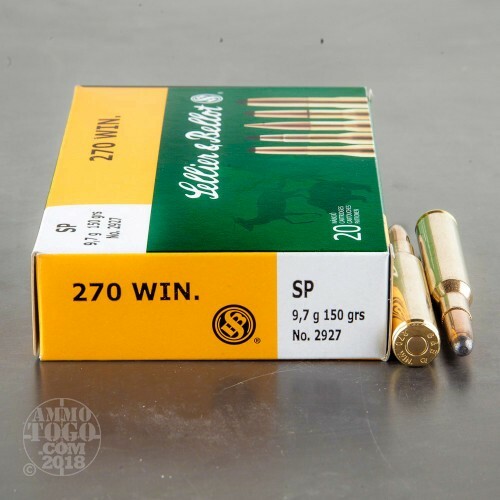 The .270 Winchester is considered one of the faster cartridges available, and you can easily find rounds that are rated at speeds over 3,000 feet per second. The 130-grain Super-X, for example, has a muzzle velocity of over 3,060 feet per second. Even at 300 yards, the bullet is traveling at 2,329 feet per second. Larger bullets will have slower stats, but they are still fast. Take the same product in 150-grain and you still have a muzzle velocity of 2,850 feet per second. Why is the .270 Winchester So Popular for Hunting in the Western U.S.? Speed and trajectory. 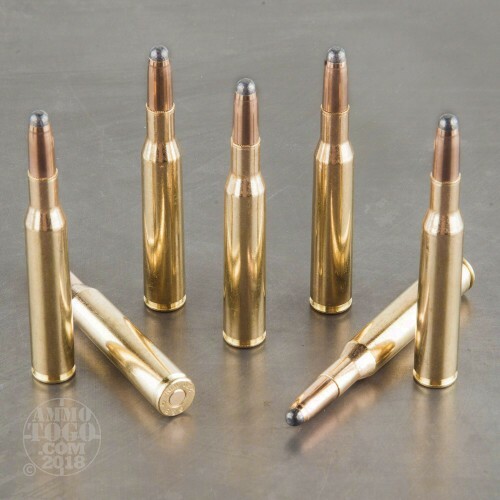 Because the bullet is excellent at delivering accurate, fast, high-energy shots at distances of 300 yards or more, the cartridge has become one of the most useful rounds for harvesting medium-sized game in the western United States, which generally calls for long shots over open ground. Compared to the east, which has more dense wooded areas, the west has a far greater need for a long-range rifle cartridge. This cartridge has been used to harvest some of the most popular game animals in the western U.S., including elk, antelope, and whitetail deer. But it is generally too small for large animals like moose or grizzly.